Why the 2008 Volkswagen R32? I was able to buy this car at over $4k below sticker, plus a received 0% financing for 4 years. This was a deal that was hard to pass up! The VR6 has real character. It tends to be a little rough on cold start-up, but the noises it makes are intoxicating. Once warm, it is smooth as a turbine. The DSG is a wonderment, changing gears seamlessly, and exactly when you ask for them. The dash top/door panels, and the leather/vinyl are first rate. The hard (cheap) plastic is regulated to the lower sections of the interior where it can hide. The doors shut very easily, with a solid thunk. All controls have a solid click. 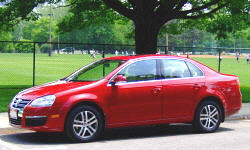 Golfs have an excellent reputation for passenger safety, and this is something that is very important to our family. With 6 airbags, ABS/TC/SC, and good seats, the passive safety is impressive. Good handling with AWD helps on the active safety front. Why Not the 2008 Volkswagen R32? 18 city 23 highway is nothing to brag about considering it only has 250hp w/ 6 gears. It has drastically improved since covering 2k miles; last tank was well over 25mpg in mixed driving. Weight of AWD, stong winds, and stop/go kill the mileage.